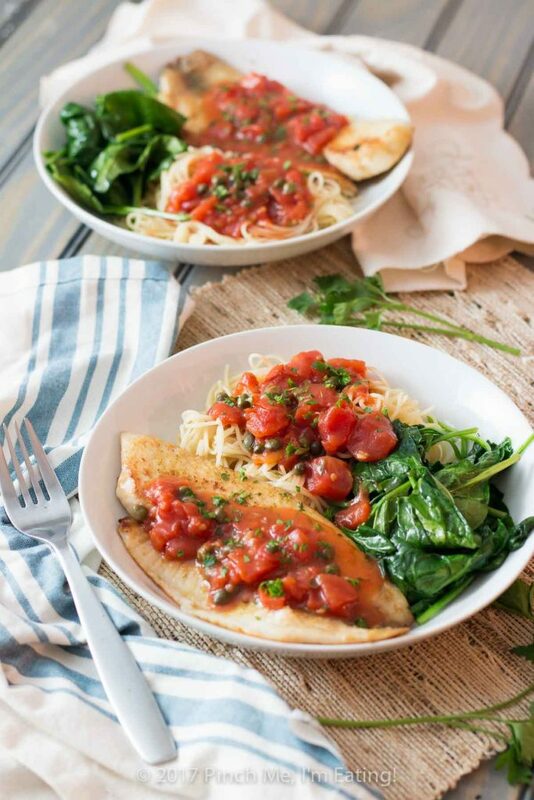 20-Minute Tilapia with Tomatoes and Capers | Pinch me, I'm eating! 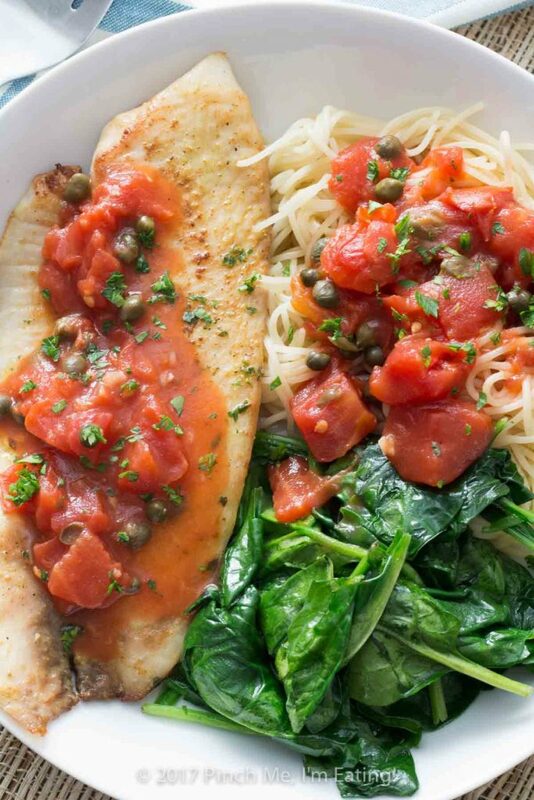 Tilapia with tomatoes and capers is easy to make for a weeknight dinner, healthy, and full of flavor! Serve it with wilted spinach, angel hair pasta, or both. 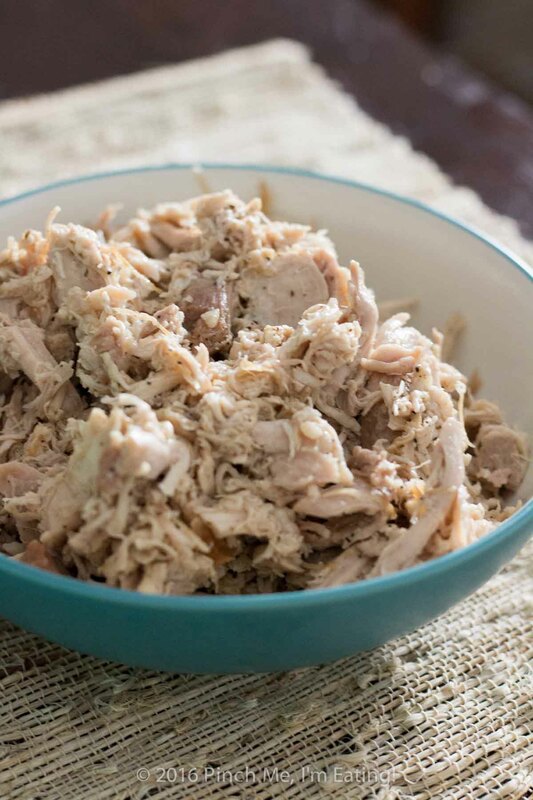 Today’s recipe is an oldie but goodie. 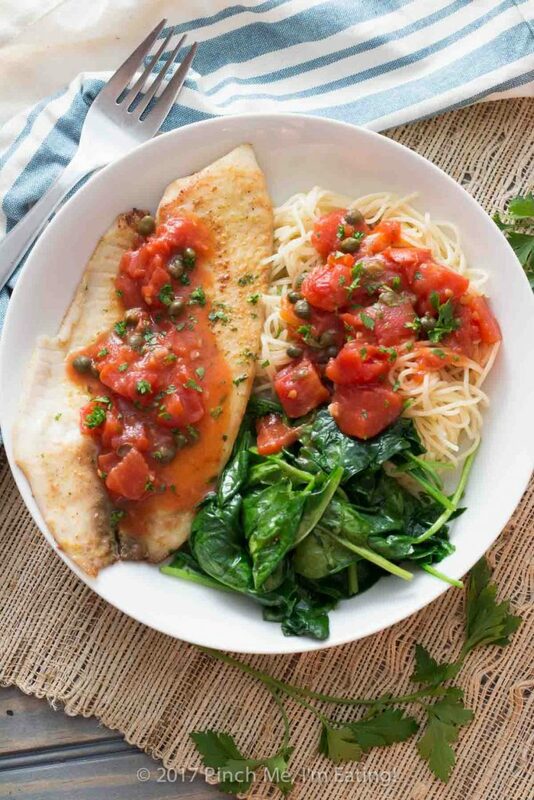 I’ve been making this tilapia with tomatoes and capers for many years, and it’s a great option for something quick, easy, and healthy. It’s hard not to be inspired and excited about a dinner so colorful, especially when it can be on the table in about 20 minutes! Although it has a butter-wine-tomato sauce, I would consider this recipe to be pretty healthy. 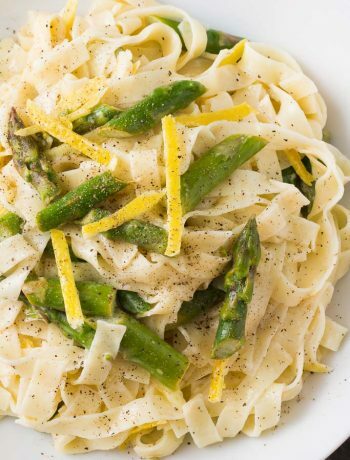 If you want to cut out the carbs, you can just serve this over wilted spinach and skip the pasta, but I do like a little angel hair with it. If you go that route, I’d probably double the spinach to bulk up your meal a bit. Mike and I tend to eat a lot of chicken but we’d like to include a little more fish in our diets. Problem is, fish is so darned expensive these days! 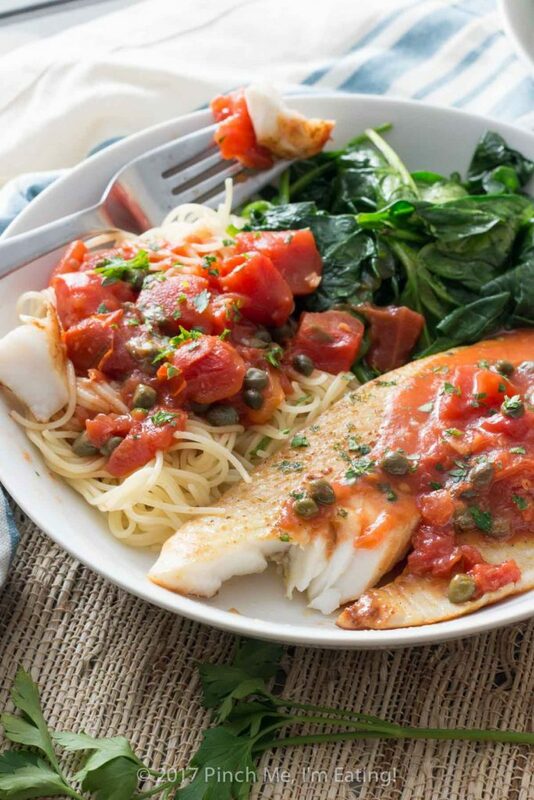 Fortunately, tilapia tends to be on the cheaper end, around $6 a pound instead of $9-11 a pound like salmon and tuna steaks, so this delicious tilapia with tomatoes and capers is a good option for a an everyday fish recipe. You may know I’m a fan of zero-prep dinners like these one-pan pork chops with spinach and mushrooms, and this is no different. 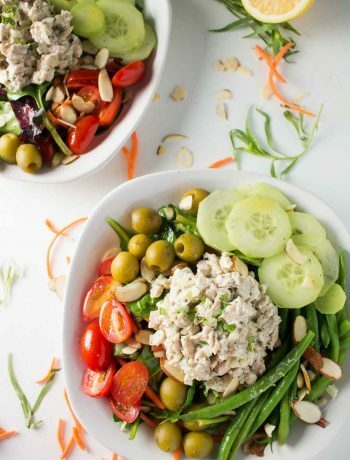 When you’re using ingredients like sliced mushrooms, canned tomatoes, or a bag of spinach, and clean meat you don’t have to trim, like pork chops or tilapia fillets, it’s so easy to have dinner on the table in no time at all and with no cutting boards to clean. The dish is simple: just sprinkle the tilapia on both sides with some adobo seasoning — I use Goya brand — and sauté it in some butter for 2-4 minutes on each side, so it’s still juicy. 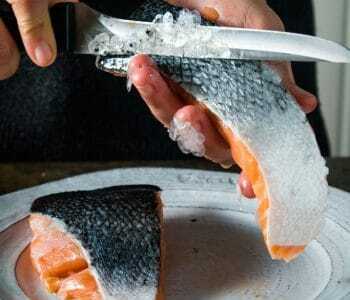 Don’t move the fish while it’s cooking, except to flip it, or you won’t end up with that nice browned coating. 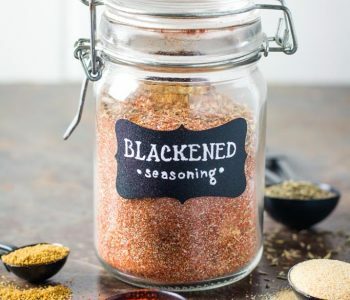 If you don’t have adobo seasoning, the ingredients in it are salt, garlic, oregano, pepper, and turmeric. One of these days I might try making my own adobo blend, but if you can get your hands on some it’s a delicious seasoning blend! The sauce is just a little more butter, undrained canned diced tomatoes, capers, and white wine, with a little cornstarch to thicken it. After I cooked the angel hair pasta and poured it into a colander, I used the still-hot pasta pot to quickly wilt the spinach in a little olive oil to avoid washing an extra pan. Worked like a charm! Take the spinach off the heat as soon as it’s wilted so it stays bright green and doesn’t shrivel up into nothing. And that’s it! 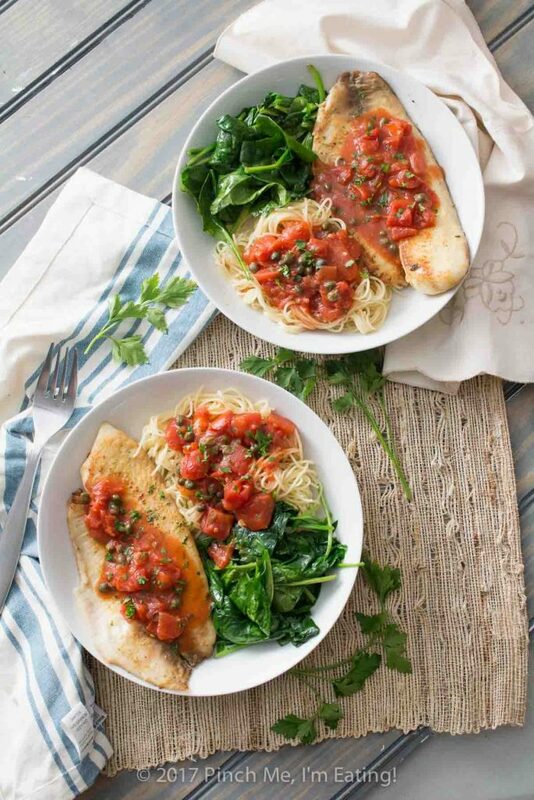 Serve up your tilapia, angel hair, and spinach, and spoon the delicious tomato-white-wine sauce over top of everything. 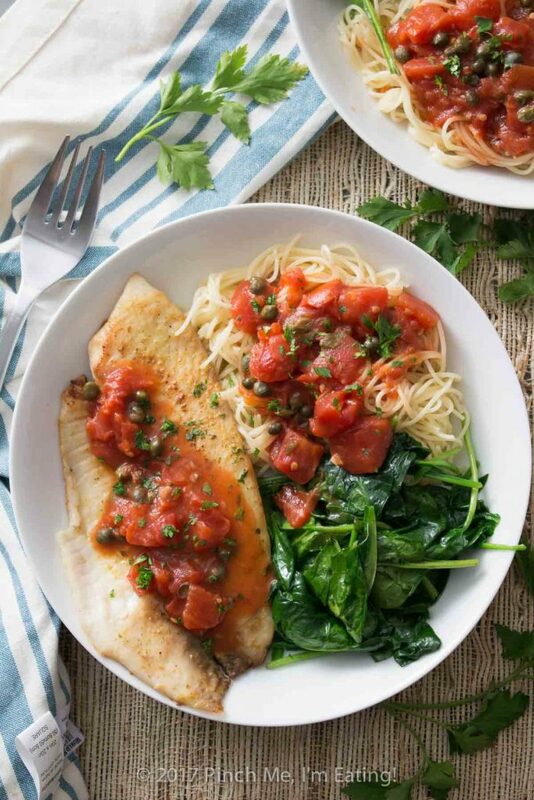 This tilapia with tomatoes and capers is flavorful and tangy, the fish is flaky and juicy, you get in a few good vegetables, and the colors are so vibrant you can’t help but want to dive in. Melt 1 tbsp butter in saute pan over medium high heat. Season both sides of tilapia with Adobo seasoning. Cook for 2-3 minutes on each side without moving. Set aside and cover with foil to keep warm. Melt remaining 3 tbsp butter in pan. Add garlic and cook until fragrant, about 30 seconds. Add white wine, capers, and tomatoes. Bring to a simmer. Add about 1 tbsp cold water to cornstarch and mix to make a slurry. Pour into sauce mixture while stirring and simmer about 5 minutes, until thickened. Cook angel hair pasta according to directions. Drain. 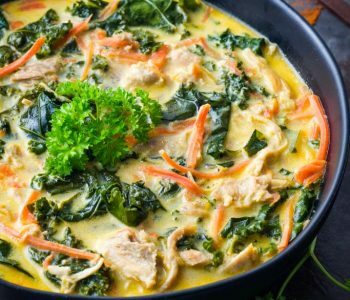 To save dishes, while the pasta is draining in a colander, add olive oil to the hot pasta pot, add spinach, and stir until just wilted, 1-2 minutes. 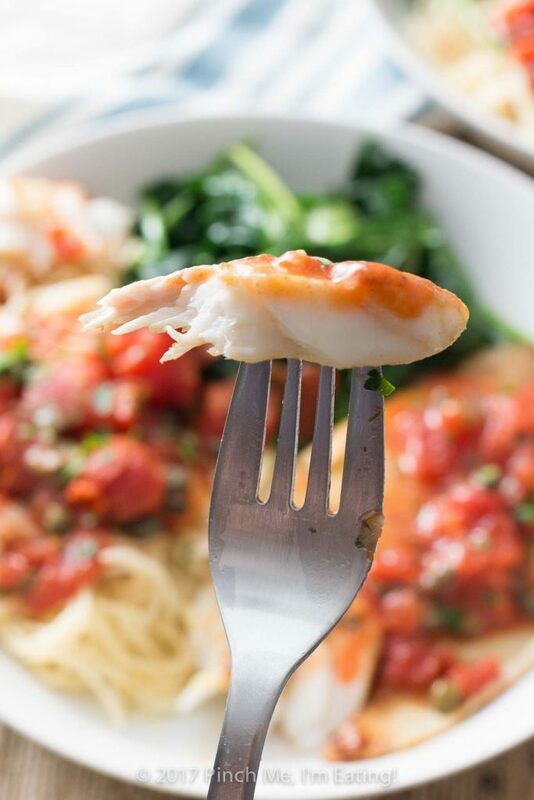 Divide pasta, fish, and spinach between plates and spoon sauce over everything. Since I insist on a good, well-prepared dinner when I am at home, this is the perfect type of after-work dish I love. Thanks, Caroline! Glad to be of service, David! Hope you enjoy it! 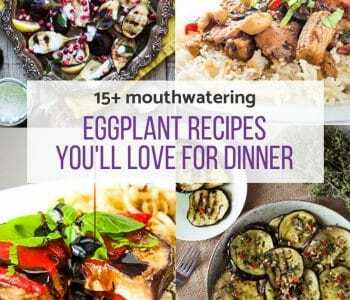 Oooh, that sounds like it would taste great! I’m so glad you loved it, and thanks for sharing! It’s such a tasty sauce for something so easy to throw together! Hope it makes it back on your menu soon! This looks great. 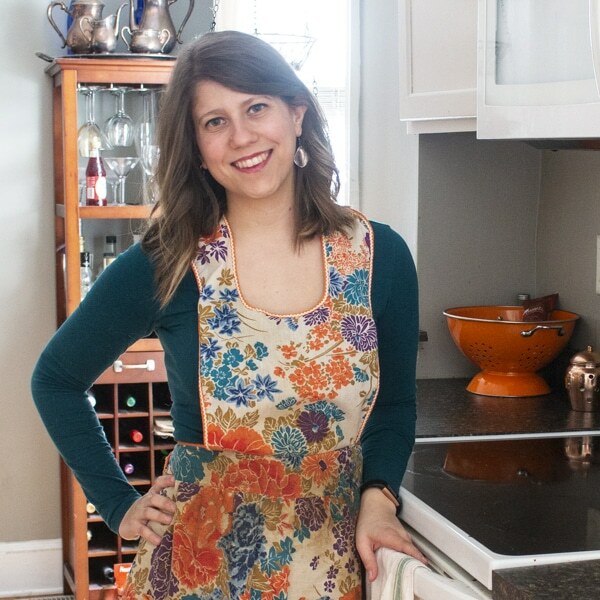 I love quick and easy dinners especially for weeknight meals! I’ll have to try this out sometime this week! Thanks! This one never lets me down! It’s a favorite! Hope you like it! So glad you enjoyed it! 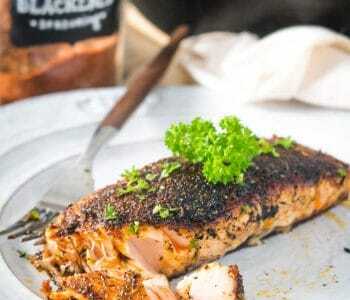 The lemon butter wine sauce sounds like a perfect companion to this!